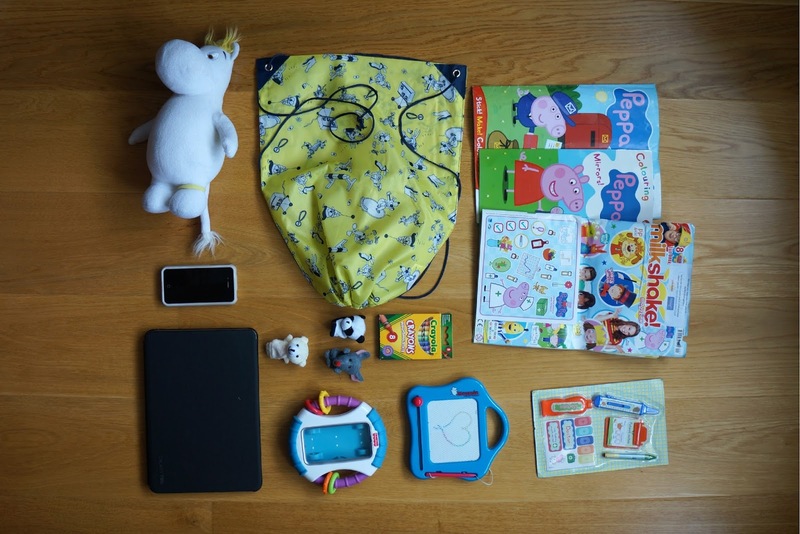 These are the items I have found are the most important to include if you want your toddler and pre-schooler to be entertained throughout a long transit. I find it is good to include a variety of items, from different categories, as tots get bored so quickly. 1. Favourite plush toy - provides a buddy to cuddle if they are a bit scared and brings comfort in strange surroundings. 2. A tablet full of their favourite programmes or movies - My daughter loves Peppa Pig and I have about three hours worth of pigtastic entertainment downloaded on my tablet. I like to hang our tablet off the magazine holder rack from its case so it works a bit like a TV. A great way to ensure they stay still, at least for a bit. You could also download some games and other apps to entertain your toddler. 3. A smart phone - it's a great idea to download loafs of kid-friendly apps. Fischer and Price do some excellent and free apps for babies and toddlers on iPhone. 4. iPhone case - with drooling babies and object-throwing toddlers, all manners of bashes occur but a case will help protect your very expensive phone. Ensures they are stuck on whatever app you have chosen for them as well and won't go on a picture-deleting rampage... Doubles up as an extra toy too! 5. A children's magazine - you can pick one up from the airport. There are lots of different ones, and they provide hours of entertainment. You often get stickers and some cheap plastic toys to occupy your child with - bonus! We bought the Peppa Pig magazine for our Peppa-mad toddler a while back and it has lasted us 4 flights. The Milkshake was a recent PR sample, and would be great for past toddler-age as well, with stories and a variety of children's TV references. 6. Crayons - to draw with and colour in the children's magazines! I think these are great. No need to sharpen, don't make a mess and if you get them on your clothing they should come off in a wash.
7. Finger puppets - something small and entertaining. Great to break out for a little surprise when everything else fails. Hand puppets are great entertainment as well. 8. A magnetic board - this is a brilliant addition to an entertainment pack as it allows your toddler to draw anywhere, and you won't have to worry about the mess or losing the crayons. Sometimes I draw pictures for her, and sometimes letters and numbers if I want to make it a bit more educational. 9. Finger foods - Lots of little snacks, like raisins or crisps, allowing toddlers to practice their pincer movement and finger dexterity. As a bonus, this should keep them occupied and contented for a while. 10. A new toy -You could also get a toy at the airport, like a plane (very entertaining playing with a plane in a plane, their little brains will explode with excitement!). Or a train on a train journey, or maybe a truck for that long car ride. Pack this entertainment pack in one bag, so it is easy to pull out whenever you might need it. A basic drawstring bag works well, light and you can close it so nothing falls out. A lot of these ideas work for kids of all ages as well, not just toddlers, so hopefully you have found some suggestions what to pack even if your children are older. Or, if you have a baby, do check out my top tips on managing flying with a baby. 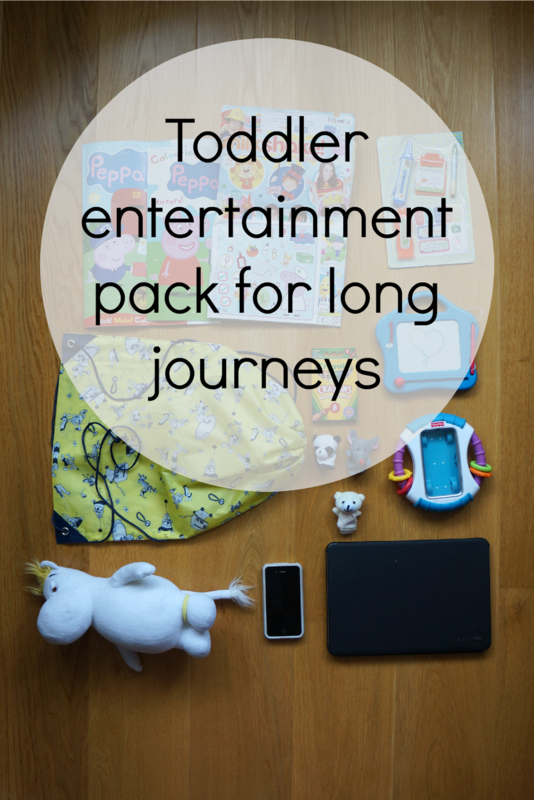 Any other ideas to entertain your toddler on a long trip or on a plane ride? It is brilliant - I think it was Fischer Price that manufactured it. Mine is iphone4, but hopefully they do versions for the new iPhones now too! When we fly with our toddler we bring LOTS of suckers and stickers! Those keep him occupied and quiet (as quiet as a 1 year old can be) but can be a little messy. Stickers and sticker books are absolutely fabulous for a journey. I also had a big bag of those craft pom poms. My daughter loved them and you can sort them according to size or colour. Brilliant, I hope they help :) I like hand puppets too, they work great as well :) good luck on your flight! I hope you will get some good advice from this post - some I think are good for older kids, like snacks and the magazines :) good luck with your trip next year ! We're flying often between country we live, mummys country and daddys country. For excempel a trip to my home country can include already four landings, so we're used to airports. Under age of two our son is having 51 take offs and landigs and luckily thinks flying is mostly fun. 1. Think what time of day it's best to fly. Tickets might be little more expensive in the time of day what would suit you best, but it might be worth of it. We try still to take longest distances when our son needs to sleep - it's good to use some of time sleeping in the airplane. And if possible, not too early or late flights when he's tired and crumpy. 2. Read and tell before flying about your trip. And when you're travelling, talk about things you have told before. At least our child feels broud when he can explain to me what he sees around. 3. Explain everything what happens even to a baby. They understand more you think and remember afterwards much more you think. That makes travelling easier next time. 4 Be in good humour and make a trip to an adventure. Your child is reflecting your feelings and if you think travelling is great fun your child is doing that also. 5. Have good time in airports, let your child to run and play. What is better than run in long corridors and have rides on escalators. You need to have lot of fun, not stress around. 6. Take with you some favourite and new toys, but remember it's almost impossible to pick them up if they fall down between seats in low-price flights. There is just not enough place. 7. Ask two pillows and planket in once when you go to an airplane if your child will sleep later. When you're already having everything ready you can make it easier your child to calm down. Toddlers are heavy - try to make your position also comfortable that you can hold your sleeping child. 7. Sing and play your childs favourite nursery songs, games and plays. At least our son can listen his favourite song thousand times without getting tired of it. Other passangers tolerate for sure better your singing and giggling child than a crumpy and impatient child which is kicking a seat front of him. 8. Take good snacks with you. Our son gets baby biscuits only in flight tours and that's something he's really waiting forward. 9. As a back up when you have already used everything you can to entertain your child have some favourite movies with you. Movies are not a magic what makes your child quiet when needed, but can work if it's not an only thing they can do. Stopping by from #TheList. What a great idea - saving this for my next flight! I hope your first flight will go well! I am sure it will :) Good luck and thanks for hosting!